In most cases PHP performance can slow down the performance of websites. To optimize and accelerate website performance you need to improve the PHP performance. For this purpose, you can use opcode cachers such as eAccelerator, APC, Memcached, XCache, etc. Personally, my favourite choice is XCache. 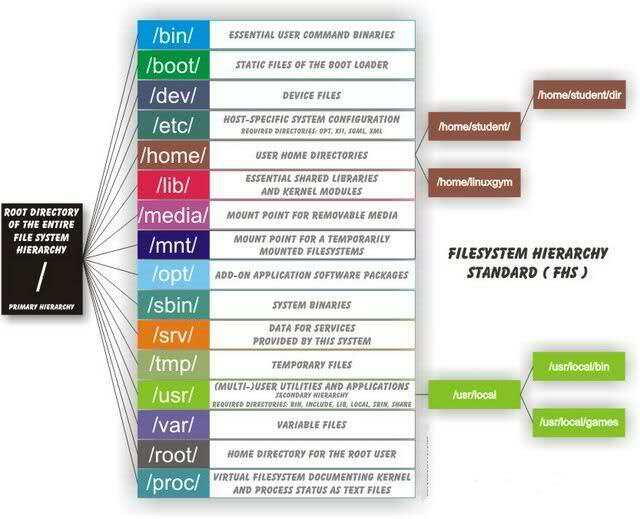 May not be 5 times faster, but it will definite improves the standard PHP installation with the opcode XCaher. This article explains how to setup and integrate XCache into PHP installation on a RHEL, CentOS, Fedora and Ubuntu, Linux Mint and Debian systems. Users who running an Red Hat based distributions, can able to install XCache through a package manager by enabling epel repository. Once you’ve enabled epel repository, you can use the following yum command to install it. By default, XCache is available for Debian based distributions from the package manager. Therefore, you can install the XCache package by using the following apt-get command. The XCache.ini configuration file has couple of settings that I do recommend you to understand as they are vital to use in this plugin. 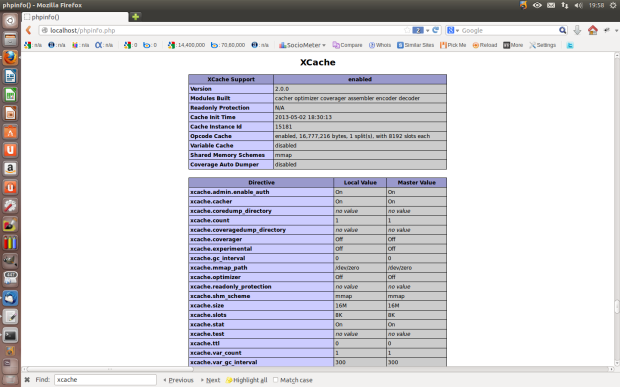 The detailed information of XCache configuration settings can be found at XcacheIni. If you don’t want to change any settings, you can use default settings as they are good enough to use with XCache. Once you’re done with configuration settings, restart your Apache web server. Once you’ve restarted web service, type the following command to verify XCache. You should see the XCache lines as shown below. Alternatively, you can verify XCache by creating a ‘phpinfo.php‘ file under your document root directory (i.e. /var/www/html or /var/www). Next, add the following php lines to it and save the file. Open a web browser and call the file like “http://your-ip-address/phpinfo.php“. You will see the following output screen shot. By default the admin panel is protected with http-auth and in disabled state, if you’ve not set a password. To set user/password open the Xcache.ini file. But, first you have to create md5 password using following command. Now open Xcache.ini file add the generated md5 password. See the following example, add your own password md5 string. The simplest way to do so is copying the whole directory xcache (admin was in older release) to your web root directory (i.e. /var/www/html or /var/www). Now call it from your browser, a http-auth login prompt window will pop-up. Enter your user/pass in, and it’s done. 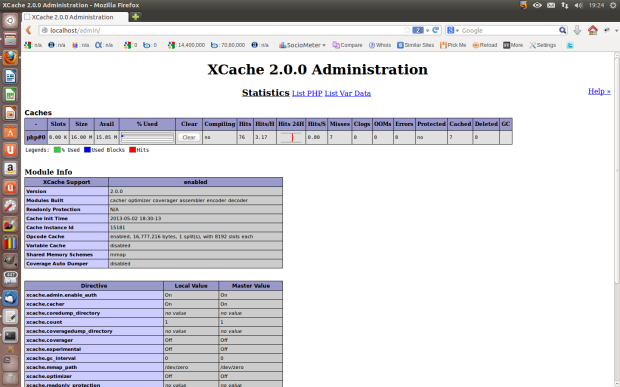 i already installed xcache with litespeed web server. but after 1 or 2 weeks , i see the wordpress sites give 500 internal server error. so i unistalled that :( . 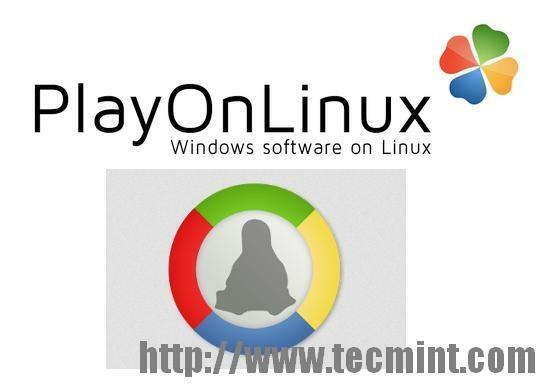 hi, I am using centos 5.6 with pleask 12 which has multiple version of php. 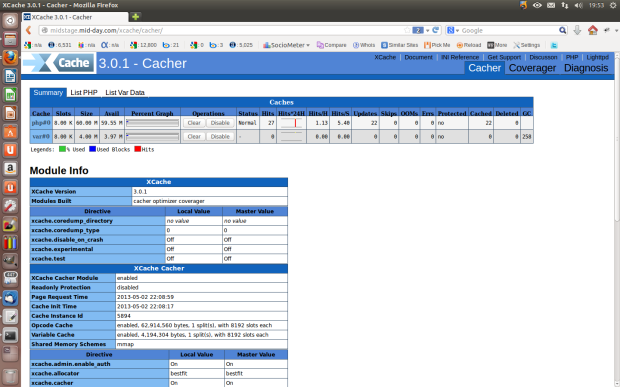 above tutorial places the xcache with php 5.3 but how to put it on php 5.6 running as one more version on plesk. thanks in advanced. then you need to compile XCache for the Php version you want to have..
Hi, thanks for this tutorial, i was install it on my LEMP server on centos 6 and i was configuration like this tutorial for access xcache admin panel but when every time iam login, the login box still appear,,, i was restart my nginx and php-fpm but still not work. Have you checked logs for any errors..and also have you generated and added correct md5 password to Xcache.ini file?